If there was ever a voice that you'd want to hear on the radio, it's Michael Young's. 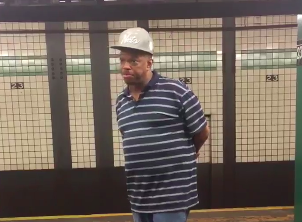 A Twitter user posted a video of Young singing in the New York City subway system, and it immediately went viral. Young effortlessly belted out "Unchained Melody" to a small crowd gathered around him. But it's not the first time someone has posted Young to social media, and he's definitely not just a subway singer. Young performs with his band Majestic K Funk throughout New York City and has also performed with the likes of Luther Vandross, Marcus Miller, Blue Magic, the Manhattans, the Ohio Players, the Stylistics and the Whispers in such New York venues as Joe's Pub, B.B. King's, the Apollo, Irving Plaza and Birdland. They don't make voices like Young's any more!